You may have heard about kratom (Mitragyna speciosa), an herbal supplement used traditionally in Southeast Asia for energy and to help ease aches and pains. Derived from a type of evergreen tree, kratom contains alkaloid compounds called mitragynine and 7-hydroxymitragynine. It’s thought that mitragynine and 7-hydroxymitragynine may help control pain by attaching to proteins called opioid receptors and, in turn, reducing pain perception. Opioid drugs (a class of medications used for pain relief) work in a similar manner, by reducing the intensity of pain signals reaching the brain. They also lessen the effects of painful stimuli by influencing brain regions involved in regulating emotion. Kratom is said to be a mild stimulant in lower doses and a sedative in higher doses. While kratom is traditionally used to boost energy and soothe stress, in recent years, kratom has gained popularity as an alternative to opioid pain medications like hydrocodone (e.g., Vicodin) and oxycodone (e.g., OxyContin). In many cases, kratom is used to manage chronic pain associated with conditions such as arthritis and fibromyalgia. 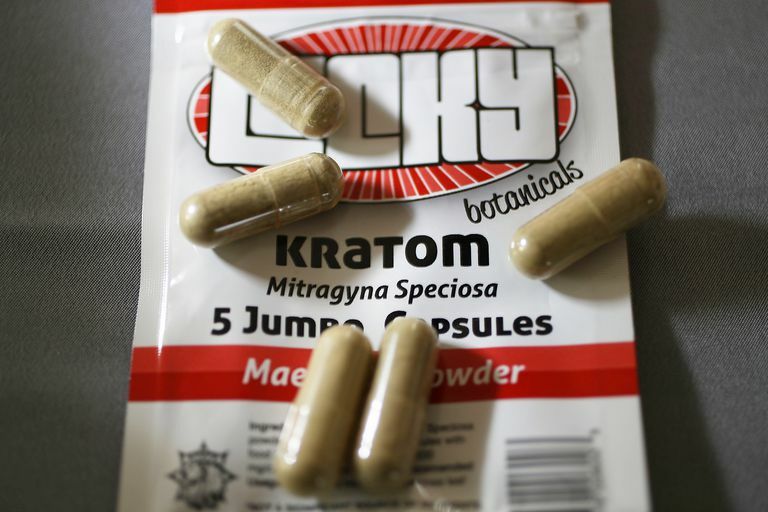 Kratom is also increasingly used as an herbal approach to alleviating symptoms associated with opioid withdrawal, such as muscle aches and mood disturbance. Since 1999, the amount of prescription opioids sold in the U.S. nearly quadrupled, according to the Centers for Disease Control and Prevention (CDC). During that time, the number of deaths from prescription opioids has also quadrupled. In addition, more people died from drug overdoses in 2014 than in any other year on record, with more than six out of ten of those deaths involving an opioid. Many proponents of kratom suggest that the herb could serve as a solution to the opioid crisis, both by offering another option for pain relief and by aiding those struggling to overcome opioid addiction. On August 30, 2016, the U.S. Drug Enforcement Administration (DEA) announced their intent to place two of the herb’s active constituents on its Schedule I drug list as early as September 30, 2016. The DEA withdrew its notice of intent in October 2016 and opened an official public comment period lasting until December 1, 2016. Also including heroin and MDMA, Schedule I drugs are considered to have “no currently accepted medical use and a high potential for abuse.” Mitragynine and 7-hydroxymitragynine are the kratom constituents set to be classified as Schedule I drugs, making possession or sale of the herb illegal. Kratom would remain on the Schedule I list for at least two years. The DEA’s intent to place mitragynine and 7-hydroxymitragynine on its Schedule I drug list was met with a great deal of backlash. In mid-September, 2016, for instance, protesters held a march and rally at Lafayette Park in Washington, D.C., and presented a petition signed by over 120,000 people opposing the ban. According to those opposing the ban, placing kratom's alkaloids on the Schedule I drug list would also stifle further research on the compounds. On November 14, 2017, the U.S. Food and Drug Administration (FDA) Commissioner Scott Gottlieb, MD, issued a public health advisory about risks associated with kratom. So far, published research on kratom’s possible benefits as a pain reliever and opioid alternative is very scarce. The available research includes a report published in the International Journal on Drug Policy in 2010, for which scientists surveyed 136 active users of kratom and found that the herb was “described as affordable, easily available and having no serious side effects despite prolonged use.” This report included no testing of kratom’s health effects or potential hazards. In a more recent report, published in Drug and Alcohol Dependence in 2014, researchers surveyed 293 regular kratom users and determined that more than half had developed severe dependence problems. Symptoms associated with kratom withdrawal included muscle spasms, sleep disruption, anger, and tension. A mouse-based study published in the Journal of Medicinal Chemistry in 2016 indicates that kratom may not slow breathing to the same extent as other drugs like morphine. Given that deaths due to opioid overdose are usually the result of respiratory depression, the study's finding suggests that further research on the compounds in kratom is warranted. Kratom appears to cause nausea, vomiting, sweating, and dizziness, in some cases. From January 2010 through December 2015, U.S. poison centers received 660 calls related to kratom exposure, according to the DEA. Withdrawal symptoms, which are generally perceived to be milder in comparison to opioid drugs, have been reported, such as increased muscle spasms and pain, difficulty sleeping, hot flashes, fever, watery eyes, runny nose, decreased appetite, mood disturbances, and diarrhea. Although case reports have reported drowsiness, irritability, palpitations, high blood pressure, poor concentration, insomnia, hypothyroidism, seizures, psychosis, hepatitis, and coma in people using kratom, it's unclear how much is solely due to kratom. Risks appear to be higher when it's taken in concentrated extracts (which have a higher potency), mixed with other psychoactive substances, drugs, or adulterants, or when it's taken by people with alcohol use disorders, a history of heroin abuse, or certain health conditions. The DEA noted that kratom has been associated with 30 deaths throughout the world, with none appearing to be solely due to kratom. Of the 15 alleged kratom-related deaths that occurred between 2014 and 2016, 14 involved other drugs or illegal substances. A cluster of nine fatal overdoses in Sweden was linked to a product marketed as "Krypton", which was found to be laced with O-desmethyltramadol, an opiate related to tramadol. According to the FDA advisory, "the FDA is aware of reports of 36 deaths associated with the use of products containing kratom." Living with pain isn't easy. If you live with pain, you may already be all too familiar with the profound effect it can have on your quality of life. If you are considering trying kratom, you should speak with your care provider first. Some pain clinics are exploring complementary approaches, in conjunction with pain treatment, to manage or cope with pain. For example, mindfulness (and other mind-body practices) may help some people remain pain-controlled despite the challenges of everyday life. Adkins JE, Boyer EW, McCurdy CR. Mitragyna speciosa, a psychoactive tree from Southeast Asia with opioid activity. Curr Top Med Chem. 2011;11(9):1165-75. Prozialeck WC, Jivan JK, Andurkar SV. Pharmacology of kratom: an emerging botanical agent with stimulant, analgesic and opioid-like effects. J Am Osteopath Assoc. 2012 Dec;112(12):792-9. Singh D, Müller CP, Vicknasingam BK. Kratom (Mitragyna speciosa) dependence, withdrawal symptoms and craving in regular users. Drug Alcohol Depend. 2014 Jun 1;139:132-7. Váradi A, Marrone GF, Palmer TC,et al.Mitragynine/Corynantheidine Pseudoindoxyls As Opioid Analgesics with Mu Agonism and Delta Antagonism, Which Do Not Recruit β-Arrestin-2.J Med Chem. 2016 Sep 2. Vicknasingam B, Narayanan S, Beng GT, Mansor SM. The informal use of ketum (Mitragyna speciosa) for opioid withdrawal in the northern states of peninsular Malaysia and implications for drug substitution therapy. Int J Drug Policy. 2010 Jul;21(4):283-8.